After posing as one of the most wealthy and promising African nations, Zimbabwe fell to its knees brought by massive inflation, civil and political unrest, and dictatorship. Recently, the country made records by the issuance of denominations only equivalent with that of the Weimar Republic when Germany itself once succumbed with the crippling inflation. 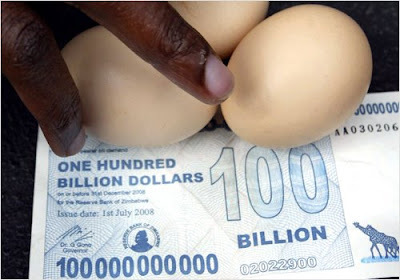 Zimbabwe's currency crisis held the country's literally chaotic that even computers and automated teller machines (ATM) where rendered useless by digits added on a daily basis. Inflation is on a massive scale that the government issues new denominations every now and then. Now, the current situation made the people abandon the fiat currency and returned to gold barter. People are piling-up on river banks to pan for gold in exchange for food and other basic commodities. "A 0.1 gram of gold can buy a tin can of rice, enough to feed an entire family for a meal. Everything is price in gold." one local claimed. "A family need 0.3 gram of gold to survive." he added. "The Global Financial crisis brought one of the unpredictable move on the paper market but the value of precious metal will continue to rise as people began to realize the flaw and start to lose trust the financial system.